TxDOT finally responded to our inquiries about this apparent bait & switch on the lane count on US 281. They produced the same schematic presented to the public and clarified the new lanes in the southern section are technically auxiliary lanes and transition lanes from the interchange, so they don’t technically count those in the lane number, however, there will be FOUR main lanes each direction up to Stone Oak Parkway. Congestion weary commuters thought they’d finally get a break. Expansion of US 281 in San Antonio is set to go to construction on Sunday, July 17, but it’s not what the Texas Department of Transportation (TxDOT) presented to the public. Today, US 281 has three general purpose lanes each direction (from Loop 1604 to Evans Rd.). The plan was to add an additional HOV-bus lane, overpasses (so cars can bypass those wretched stop lights impeding traffic flow), and to build frontage roads to the outside of the existing highway.However, the plan now shows only two express lanes each direction and one HOV/bus lane. So they’re taking away an existing express lane and shrinking the expressway from three down to two. The unelected bureaucrats at TxDOT and the local transportation boards point you to the new frontage roads as the new capacity. TxDOT’s explanation as of July 10, 2017: The $192 million project to expand US 281 to a six-lane expressway with frontage roads between LP 1604 and Stone Oak Parkway will begin on July 17. The finished product will have three express lanes in each direction, one of those lanes being reserved for transit and carpool vehicles. Frontage roads will match the existing road today with two or three lanes each way. I went to Jacobs Engineering to review the plans a year ago to ensure there would be four main lanes each way — three general purpose lanes and one HOV-bus lane each direction (because this has been a bone of contention for over a decade). 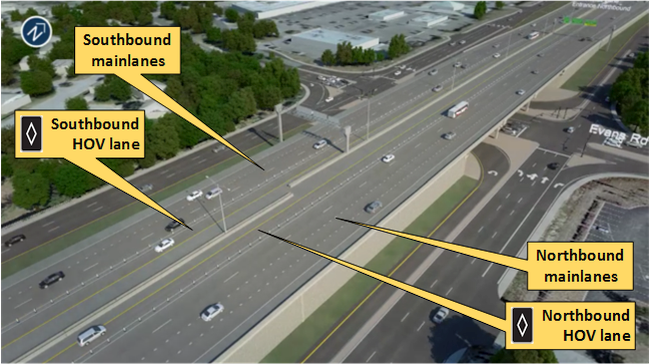 Now, that’s not what they’re going to build according to a new schematic being promoted by TxDOT. Too bad so sad for John Q taxpayer, though. They pulled a fast one and they’re going to construction this weekend. Bait & Switch: This is what was presented in the final public Open House for the US 281 project in May 2016. 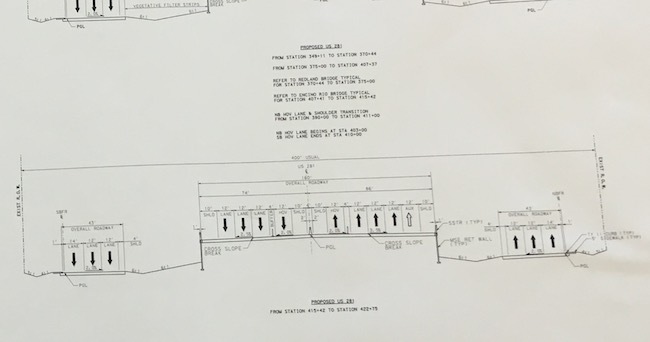 We obtained this directly from the consultant doing the schematics, Jacobs Engineering. Compare this to the schematic above and you’ll see they’re shrinking exisiting highway capacity and converting an existing general purpose lane into a restricted HOV-bus lane, which violates both current law and a law that takes effect on September 1 — a law we worked to get in place for precisely this reason — to prevent TxDOT from intentionally causing congestion on our public highways by converting existing lanes into toll lanes or other restricted lanes and crediting frontage roads as the new ‘highway’ capacity. To add insult to injury, Webber got the contract. Webber Construction passes itself off as an American company, but it’s a subsidiary of Ferrovial, the parent company of Spain-based Cintra who tried to privatize and toll US 281 back in 2005. It’s also the company that went bankrupt on the first Texas public-private toll project, SH 130. Of course, nothing is coincidence when you’re dealing with a crony system deliberately set-up to abuse taxpayers by allowing unelected bureaucrats to direct contracts to well-connected companies. Cintra’s lobbyists have been alive and well at TxDOT and in the state capitol since toll roads became Rick Perry’s legacy 15 years ago. The timing is suspect, too. Anti-toll groups just passed a new state law that protects taxpayers against the conversion of an existing general purpose lane into an HOV or toll lane (or from having a general purpose lane downgraded to a frontage road). However, it doesn’t take effect until September 1. Many consider Texas the cradle of liberty and a bastion of limited government conservatism. But who let’s a state agency abuse taxpayers and deliberately thumb their noses at a state law they know is coming online that was passed by wide margins by the people’s duly elected officials? Who sits idly by and allows bureaucrats to overrule their elected representatives and sneak in a change that shrinks highway capacity and will do irreparable harm to a major U.S. highway for a generation? Apparently Alamo city state and local elected officials will unless the people speak up.